We would all like to forget the cheap plywood paneling of the ’70’s and with good reason. But we can still have wood in our homes today and bring in the feel of natural materials and upscale styling, without the upscale price! How? 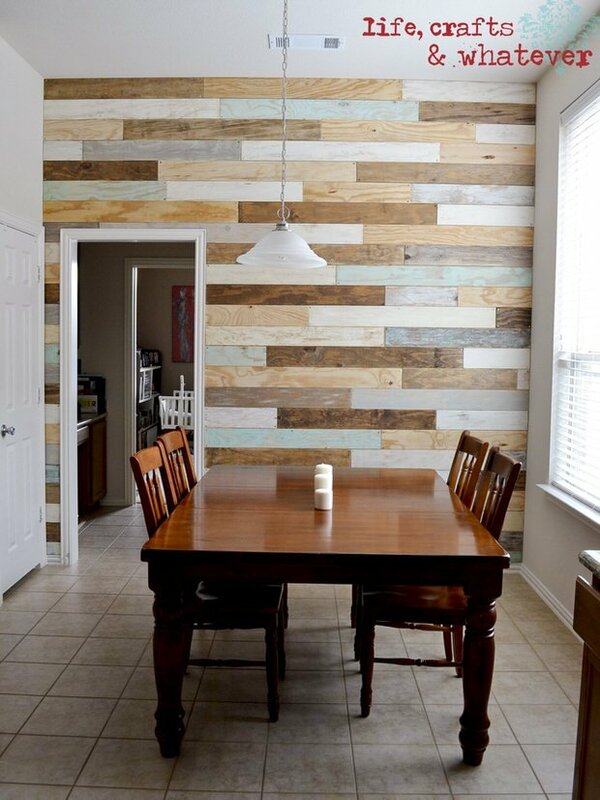 DIY wood walls! Whether you use re-purposed wood or new materials, follow these step by step instructions and get ideas from these DIY wood wall projects. 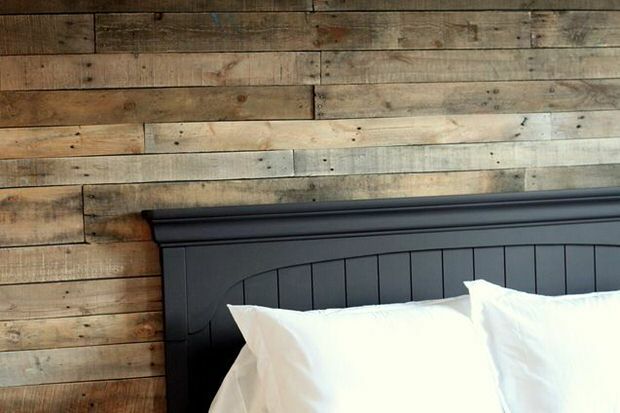 ‘Just a Girl‘ blog made this wonderful pallet DIY wood wall, and she has a two part instruction page. I love how she embraces the imperfections, I’m all about that! 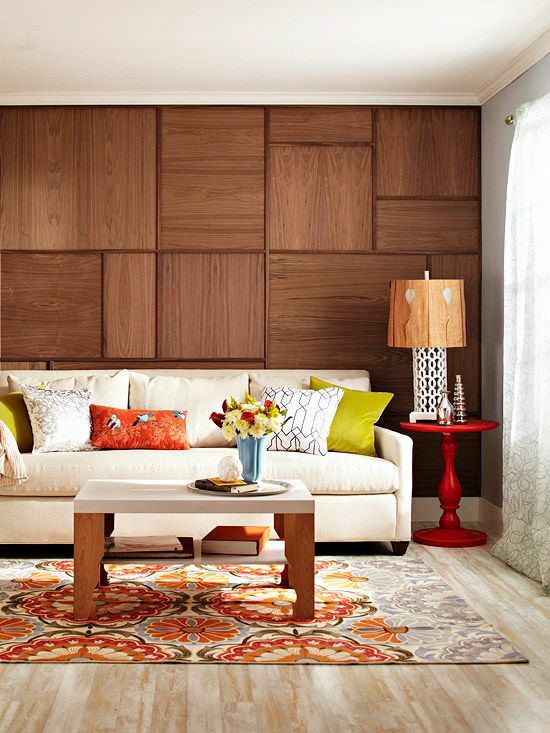 From ‘BHG‘, make this veneer grid DIY wood wall that has a sophisticated flavor and just a touch of mid-century feel. A little bit Mad Men! 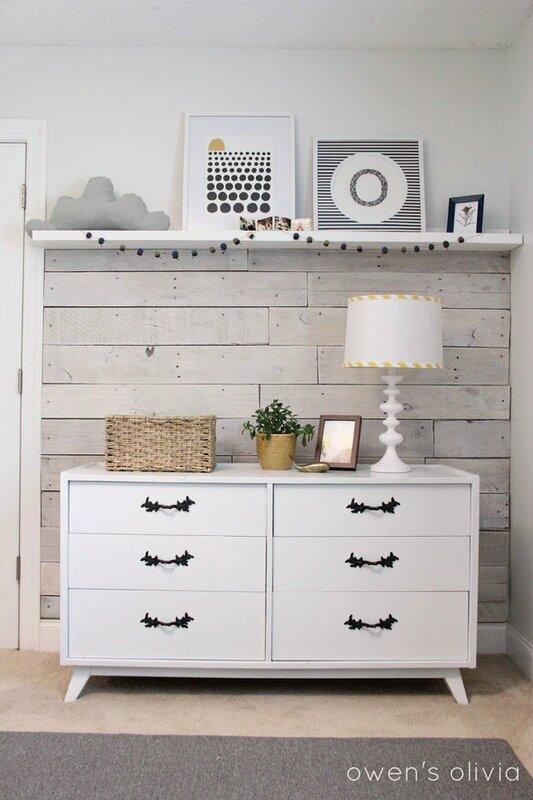 ‘Mom and Her Drill‘ and another DIY Pallet Wall… Check out her before and afters and see what this wood wall did for this room! 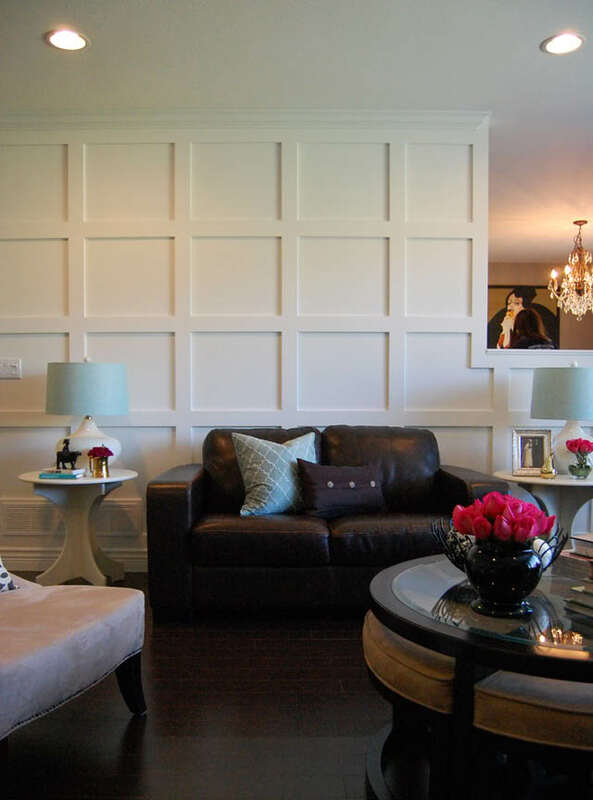 Nancy at ‘Marcus Design‘ has a full tutorial for us on her paneled DIY wood walls. Lot’s of photos for you visual people here. This looks amazing, like a showcase home! At ‘Owen’s Olivia‘ they created a whitewashed DIY pallet wall with a gallery shelf for their little boys’ room, and it looks really great. Amazing how a free material can look so high end, isn’t it? So this next photo is not a DIY project unless you make it one… It is a product we found that is an amazing helper to the DIY’er. (And no, we do not get anything for saying so!) It’s called Stikwood, and it pretty much is what it says. 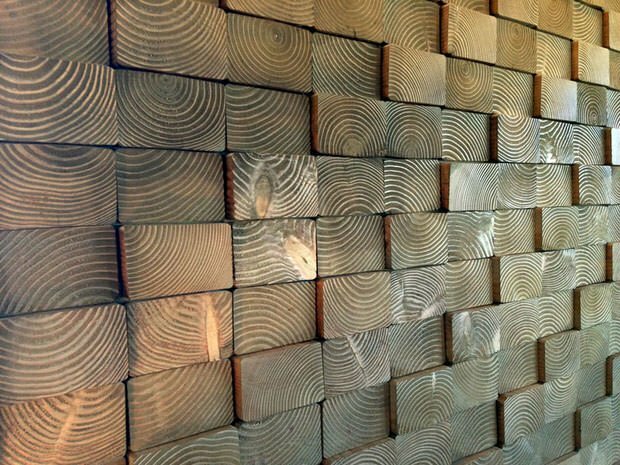 It’s a peel and stick REAL wood wall. Or whatever you want to stick it to, that is. Reclaimed wood thats like a giant DIY sticker. How fun is that? From one of our own posts on textured wall treatments, we had to include this four by six end wood wall… because we took this shot at one of our local Parade of Homes… we have ideas at that post on how to DIY this, so let us know if you give it a try! Need more inspiration? Try these! 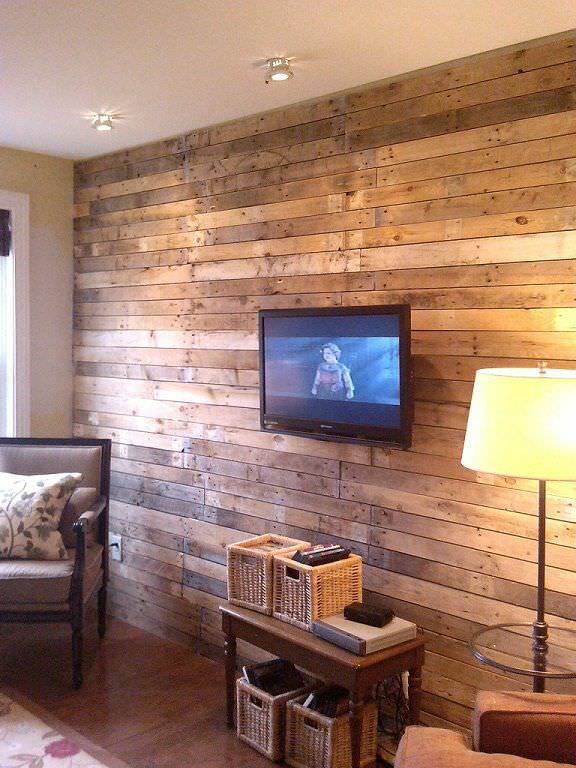 Pallet walls don’t have to be all brown! Lastly, it doesn’t have to be a boring pattern either. This herringbone pattern proves that! Don’t be afraid to go a step beyond paint if you want a really special home! 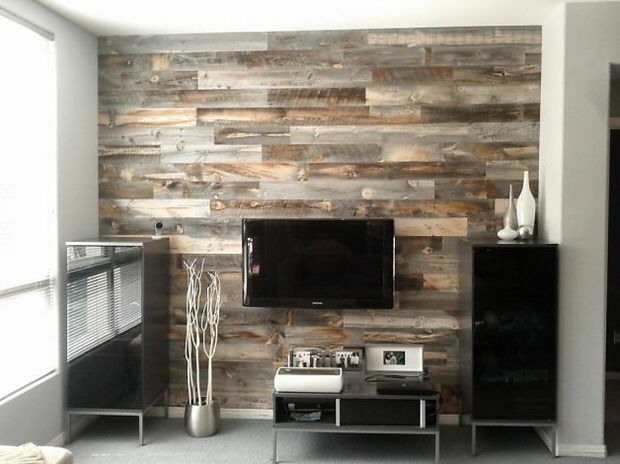 We bet you are running to the lumber store after all these great tutorials for DIY wood walls! We think you will also want to check out our posts on Stone & Brick Accent Walls and DIY Area Rugs! You’re right, Kathy. I love how these wood walls make the home look a lot more upscale. Thank you for posting these wall inspirations! I personally like Life, Crafts & Whatever’s wood wall idea as well as the veneer grid wall. Please tell me how I can order that wooden large wall mirror that is on your post on Pinterest . It’s the one where there are candles on a stand and a bench with pillows. I also would like to purchase that bench. I want this look for my entry way. Can you please help me out how to get these item. Thank you! Im sorry, those aren’t our photos so we can’t help there! You can try following the photo credits and contacting the blogger whose photos they belong to! Where did you find those black benches in your entryway? Those would be perfect for mine! Hi Dana! Unfortunately, that isn’t our photo, there is a link with the image so you could try to contact ‘The Natos’ and see if they have the info for you! Good luck! These are nice ideas for giving some wood-looking appearance to the home. BTW, do we have to apply some termite resistant thing on these rusty pallets after installation? The first pic that you shared. Looks good and I am planning something similar for the the living room. Our pallet wood screen porch. Hi Bruce! Wow! I would have never even guessed that was a porch! Amazing project! Can we link to your Facebook page so our readers can see how you did it? I just had my husband do the wood panel wall in my dining room. I love your great ideas!